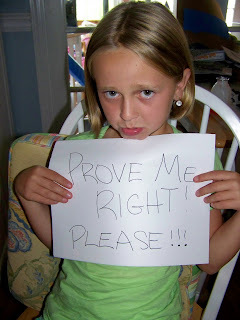 Confessions of a Semi-Slacker Mom: Sassy's not the only one! Do y'all remember the Not Mom of the Year contest hosted by Life Without Pink & The Mommyologist that Sass & I entered last week? If not, you can read it HERE. Well, guess what! We made the Top 10 Finalists!!! I told Sass that I was a finalist & she said "Told you so". Can 8-year-olds vote? I had so much fun with this contest & have met tons of mommas who are just as Semi-Slacker as I am. Maybe I should start a club? Sass & I have been going through some issues lately & writing this post together was really fun. She loved making fun of some of the stuff I do that drives her crazy. So now I need YOUR vote! Go to Life Without Pink, stroll to the bottom & cast your vote for Semi-Slacker Mom. Don't just do it for me, do it for Sassy! And if you need further proof that I'm NOT Mom of the Year, this is what happened yesterday while I was smoking crack attempting to make a hot mess homemade play-doh. Oh.my.stars!!!! 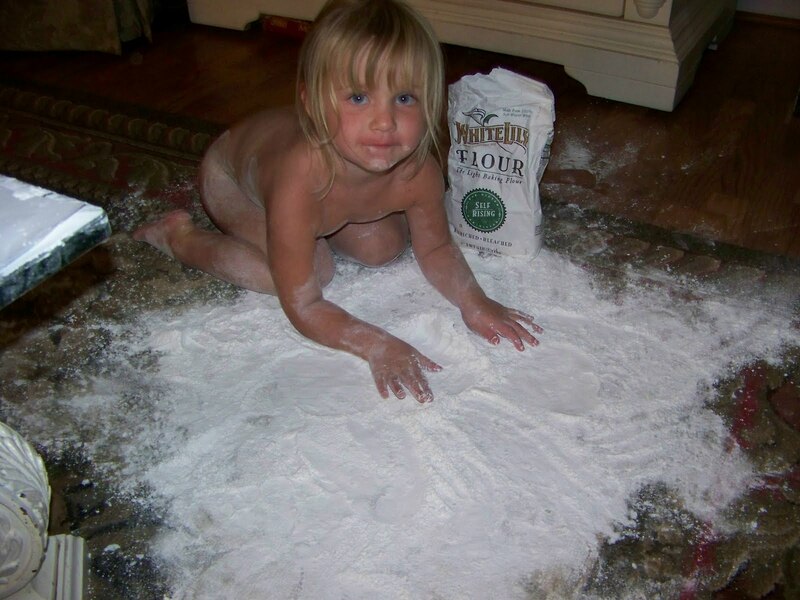 I cannot believe that is flour all over your rug. I would be in a hissy. LOL! Good luck in the contest. Keep me posted on Sassy's testing results. Prayers for all of you! OMG on carpet?? You must have had fun cleaning that one up! My son (and his cousin who is the same age) got into my Mom's pantry once when they were two. The spilled an entire gallon of cooking on on the floor of the pantry and played in it! OMG, I was seriously thinking, "is she really naked?" When I was pregnant with Bud we were doing a lot of "baby" practice with the doll because I was terrified that Baby Girl would kill him after he was born. One evening I walked in the hall and she had her doll and a bottle of baby powder and it looked just like that picture. Except she had clothes on. Oh My GARAGE, that is hysterical. The naked flour pic AND your Sassy pouting. I saw the finalists - good luck! All the posts were awesome! Questionable parenting. Oh, I totally have to vote on that! NO wonder you have to take Zanax! That is so funny! I was busy painting tonight and Maddox was in the living room dumping ALL the goldfish on the living room floor then jumped on them so he could "crash them up"! Crush them up maybe? Geezzz! I voted for you! Your poor rug and poor you for having to clean all that up! I can't imagine! Hope today was better! Ha on the carpet and love that it is naked. Come to my castle--you would be right at home. Good luck with the rug! I'm voting for you now friend. Oh baby girl baby girl. You get an A+ at this mommy thing. How do you do it?? Hey are you giving lessons on how to handle stuff like this because if you are I need to sign up!!!! On your carpet?? Oh my. Yes, there IS a reason stores sell that stuff. hahaha. Bwahahahaha!!!! Too bad you can't add that on your Not Mom post. It's so funny! Man did i just laugh so hard!!!!! your blog is great im glad i came across it!!!!! Wow, thanks so much for the follow. If you hadn't, I would never have found such a great blog! Have had fun reading, thanks. Following you back, for sure.